Imagine the smell of wild meat roasting over charcoal. If you are a cultural foodie on holiday with family or friends, then we suggest you try The Carnivore restaurant in Nairobi, Kenya. This is a unique pit stop before you venture into the Masai Mara for an African safari! 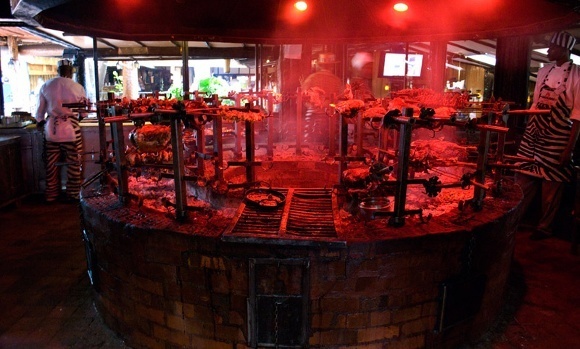 As you step inside the restaurant entrance you are greeted by the heat of the mammoth charcoal pit teeming with juicy cuts. The polished African waiters busily stride around from table to table with great Maasai swords, offering an array of meats to be speared onto your sizzling cast iron plates. 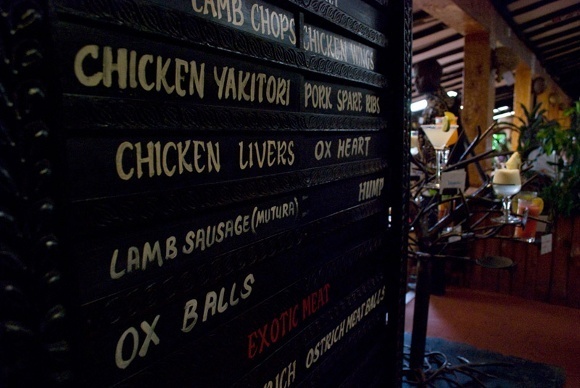 Aside from the usual beef, lamb and pork, you can also try skewered kidneys or more wild cuts of local ostrich, crocodile and camel! If you are seeking a tranquil, intimate dinner then we don’t feel The Carnivore will hit the mark. The large restaurant sprawls from its authentic, rustic indoor dining area into some pleasant tropical gardens for dining al fresco. If any fellow diners are celebrating a special occasion then the evenings often result in waiters serenading a table with the popular Kiswahili greeting song Jambo Bwana, accompanied with some native East African instruments. 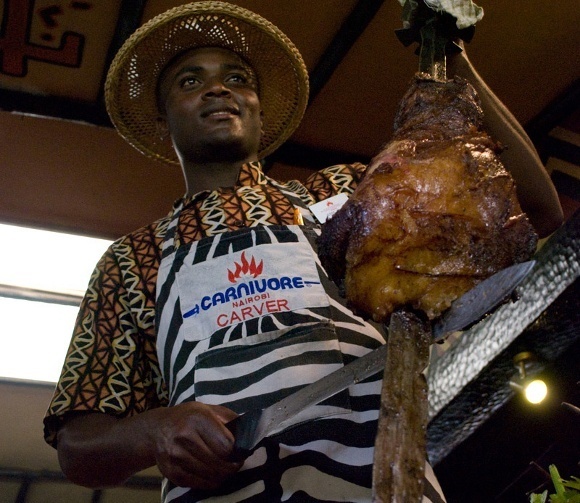 Yet if you are looking for a unique Kenyan fixed price family meal then The Carnivore is perfect. Restaurant magazine has selected The Carnivore twice in its world’s 50 best restaurants awards. The restaurant’s unique animal-print interior décor provides an Out of Africa ambiance within the city. Despite the name, we found that the atmosphere and charm of The Carnivore even pleases vegetarian guests, as long as they don’t take offense to the rich barbeque aromas. A unique a la carte menu provides a banquet just for them, alongside the trimmings of superbly dressed salads and desserts. In the true words of the Kenyan proverb Haraka haraka haina Baraka (translated as Hurry, hurry, has no blessing), you can sit and feast away until your stomach’s delight. You can then declare your defeat by lowering your table’s little white flag. For energetic members of your group, you might wish to head to the adjoining nightclub called Simba Saloon where you put on their dancing shoes to the latest tunes – from contemporary African music to hip-hop, rock and jazz. Enchanting Travels Top Tip: A trip to Kenya might feel incomplete without a sundown drink called Dawa. Similar to Brazil’s Caipiroska, this is a vodka-based cocktail with dark sugar, lime, crushed ice and a Dawa honey stick. African folklore suggests this is a traditional medicinal drink that cures all ailments. Explore East Africa and enjoy a tour of Kenya with a private and tailor-made tour.